The C. Willard Heckel Inn of Court was founded in 1990 to further civility and excellence in the practice of law in New Jersey in both the state and federal courts. The Inn’s core focus is on criminal and related civil practice in both the federal and state court systems, although many of its programs involve issues of broader appeal to the bar. 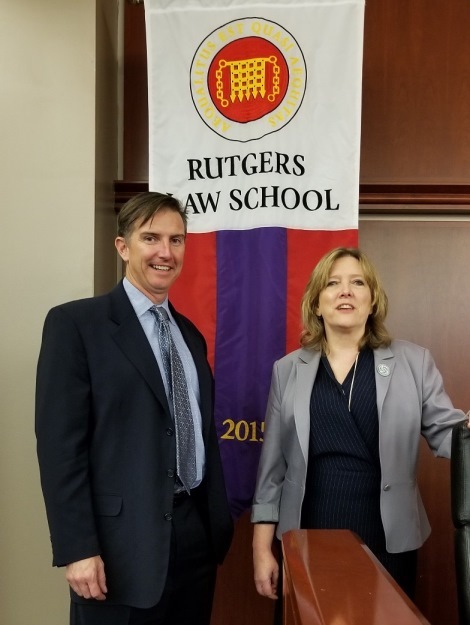 The Inn brings together highly experienced and distinguished justices, judges, trial attorneys, members of the bar, and Rutgers Law School students to enhance their skills and focus on emerging and important issues facing the bar and bench. Sponsored by Rutgers Law School, the Inn holds 2-hour meetings at the law school in Newark, followed by dinner. The Inn’s programs qualify for over 12 continuing legal education credit hours, including ethics credits in New Jersey, New York and Pennsylvania. Download the application from the box below. Mail your application with your check or credit card payment receipt. See Membership Types and Dues section to pay by credit card or use the link in the application. For more information about the Inn, contact IPE@law.rutgers.edu or 973-353-5928. Heckel joined the faculty of Rutgers Law School in 1946. He was its dean from 1963 to 1970, and served as acting dean in 1973 and 1974. Dean Heckel taught, among other things, Constitutional Law and had a keen interest in mentoring students and improving the legal system. During the 1960's. Heckel served as president of the United Community Corporation, the umbrella organization that funneled federal funds into the Johnson anti-poverty campaign. This corporation played a key role during the period before, during and after the riots, helping to empower the people of Newark to take over the city government from a corrupt regime. In addition, Heckel initiated the process of forming the Newark Legal Services Project, the pioneer legal services project in New Jersey. Heckel, who was born in Bloomfield, New Jersey, earned a bachelor's degree from Dartmouth College, a master's degree from Columbia University, and a law degree from Rutgers. This program provided an overview of the current status of medical cannabis in New Jersey. The speakers discussed proposed legislation to expand medical cannabis and adult use cannabis. The robust dialogue among speakers and participants raised many important policy and ethical issues facing lawyers and others in the industry. Sean Mack | Partner | Pashman Stein Walder Hayden P.C. As of October 1, 2018, new expungement laws have drastically changed New Jersey’s expungement procedures. This lecture identified those changes to the law and provide practical advice on navigating the expungement process. This panel discussion discussed how the Fourth Amendment can protect privacy rights in the digital age. The speakers addressed recent shifts in Supreme Court doctrine through the lens of four emerging topics: (1) the use of “Stingrays” for cell phone surveillance; (2) digital searches and seizures of electronic devices; (3) account searches and the “third-party doctrine”; and (4) government hacking. The program will provide a short introduction to each issue, teach lawyers to identify them in their cases, and suggest key Fourth Amendment arguments for challenging them in court. Aidan P. O'Connor | Partner | Pashman Stein Walder Hayden P.C. Pupillage group meetings from 5:30 p.m. to 7:00 p.m.
To pay by credit card, select your membership type and you will be redirected to the payment site. Please include a copy of your receipt with your membership application. The dues paid to the Inn include the annual dues for the American Inns of Court. Members attend Inn programs, earn continuing legal education credits, and continue sharing experiences and insights during the post-program dinners. James A. Plaisted, Esq. | Pashman Stein Walder Hayden P.C. The first meeting was a panel discussion of challenging ethical issues that face criminal practitioners. The speakers were the Honorable Walter Timpone, Justice of the New Jersey Supreme Court; the Honorable Alberto Rivas, the Assignment Judge for Middlesex County; the Honorable John P. McDonald, J.S.C., Family Division for Somerset County; John M. Fietkiewicz, Counsel to the U.S. Attorney for the District of New Jersey; and Jeffrey D. Smith, president of the Inn and partner at DeCotiis, FitzPatrick, Cole & Giblin, LLP. Tim Anderson, Vice President of the Inn, moderated a program called, “Persuasive Legal Writing: Tips from Specialists.” The panel included Sabrina Comizzoli, Executive Assistant U.S. Attorney, USAO, District of New Jersey; Karina Fuentes, Research & Writing Attorney, FPD’s Office, District of New Jersey; and Jeffrey Mandel, The Law Offices of Jeffrey S. Mandel LLC, author of the Gann publication New Jersey Appellate Practice, who taught an intensive appellate legal writing class at Rutgers Law for 16 years. The panelists provided ways to improve the effectiveness of your legal writing -- everything from briefs, memos, and motions, to legal letters and even emails. YOGI BERRA EXPLAINS CRIMINAL JUSTICE REFORM: “IF YOU DON’T KNOW WHERE YOU’RE GOING, YOU’LL END UP SOMEPLACE ELSE." 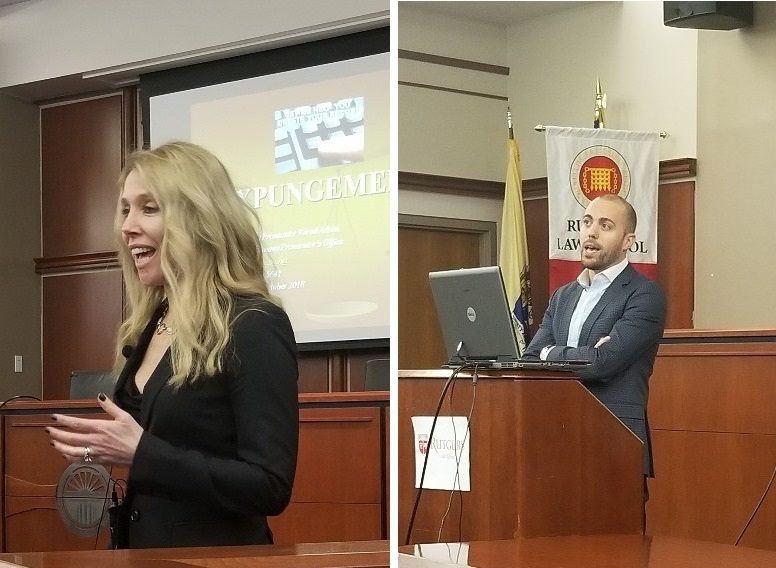 Chris Schellhorn, a barrister of the Heckel Inn and assistant prosecutor for the Morris County Prosecutor's Office, organized the program; the Honorable Regina Caulfield, a judge in the criminal division of the Superior Court of New Jersey, shared her judicial persepective; and Brian J. Neary, a criminal defense attorney and adjunct professor at Rutgers Law School, offered his perspective. Heckel Inn Master of the Bench, Aidan O'Connor from Pashman Stein Walder Hayden P.C., moderated a panel that included Mary Toscano, Chief of the Organized Crime/Gangs Unit at the U.S. Attorney's Office for the District of New Jersey, Eric Breslin from Duane Morris LLP, Michael McGowan from Stroz Friedberg, Barbara Rudd, a private investigator, and Melissa Derr from Critical Defence. The Honorable Martin G. Cronin, a judge for the Essex County criminal division of the Superior Court of New Jersey, Chris Schellhorn, an assistant prosecutor for the Morris County Prosecutor's Office, and a barrister of the Heckel Inn, Judith B. Fallon, the deputy public defender for Passaic County, and president of the ACDL-NJ, and Ryan Magee, an associate of Riker Danzig and the Heckel Inn, and former assistant prosecutor, discussed detention hearings in light of New Jersey's bail reform overhaul, followed by small group mock detention hearings led by the speakers and Inn masters Tim Anderson, Bill Neafsey, Zahid Quraishi, Sam Moulthrop, and Jeff Smith. This was a practical approach to preparing for detention motions, arguments to make (and not make) at the motion, and potential benefits of detention (i.e. speedy trial). Andrew L. Rossner, a master of the Heckel Inn and associate dean for professional and skills education at Rutgers Law School, share best practices and techniques for effective and persuasive closing arguments. This program provided an overview of the Federal Rules of Evidence as they apply to the admission of business records and electronic evidence like social media. The speakers were Heckel Inn Masters of the Bench John M. Fietkiewicz, Counsel to the U.S. Attorney, and Jim Sonageri, of Sonageri & Fallon. Following the overview, we the pupillage groups practiced and discussed the practical application of the evidentiary principles. 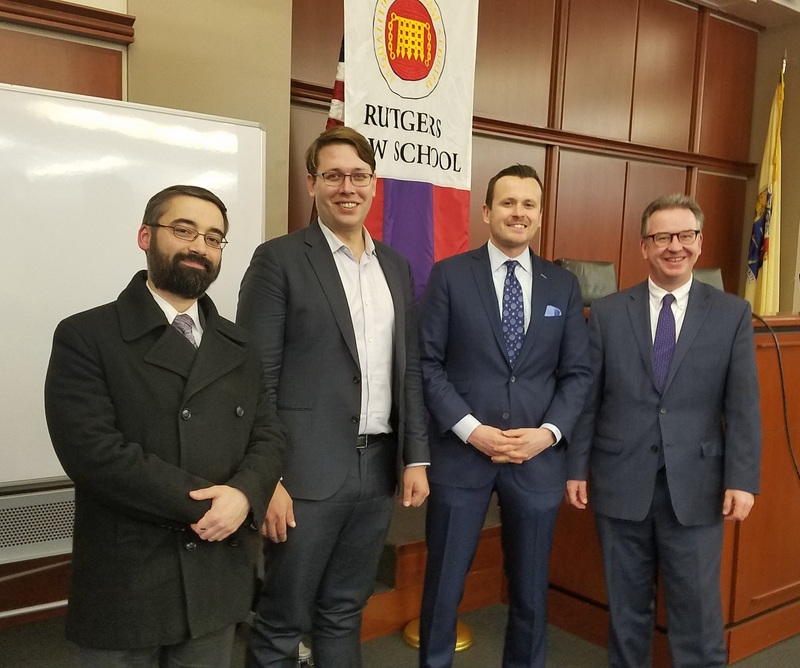 The speakers along with Tim Anderson, Samuel P. Moulthrop, Aidan P. O'Connor, James A. Plaisted and Zahid N. Quraishi guided the pupillage groups. This was fantastic. I would love to do the full 3 hour course. Good lecture. Enjoyed the clinic. Love the written material. The program provided an overview of the background and basic structure and rules of the United States Sentencing Guidelines and address the application of the Guidelines to situations common to federal practitioners. A number of applications of the Guidelines wukk be addressed in connection with financial and tax crimes and drug offenses, among others, through case studies and practice tips. Very qualified panel; excellent presentation. New Jersey’s comprehensive criminal justice reform is now in effect. This program addressed questions such as: How is bail reform actually working? How long will clients be held before you can engineer a bail hearing? What can you to do expedite it? How do you escape detention for your client and achieve release? Great presentation especially considering that the new bail system is just being implemented. Confusing subject matter made simple! The topic, speaker and materials provided surpassed my expectations. Glad to have speakers who ask questions to audience in between rather than after. Good to have both prosecutor view and defense view. Very knowledgeable speakers. Left with very clear understanding on a topic I had little to no information about prior to this CLE. This fast paced ethics program focused on real ethical issues that confront criminal law practitioners through the use of hypothetical fact patterns based upon recent ethics cases. Interesting and engaging discussion that kept the audience involved. Good use of hypotheticals. Best ethics CLE I’ve be to! Very interesting and informative. The inclusion of sample materials and NJ statutes/rules in the program materials is very useful. 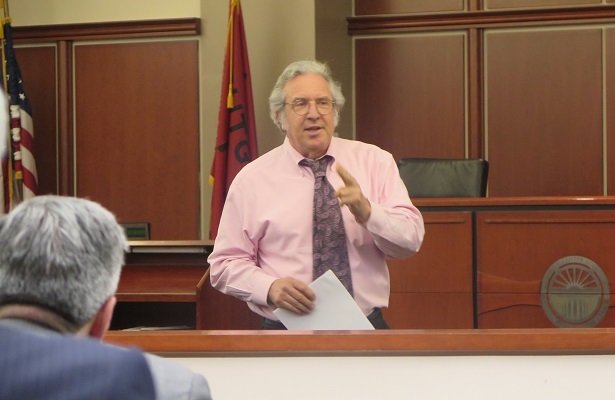 The esteemed panel of sitting and retired judges and justices addressed practice before the Appellate Division and Third Circuit. Attendees had the benefit of hearing the judicial perspective on what to do and what to avoid when handling appeals. The Honorable Gary S. Stein | Special Counsel | Pashman Stein Walder Hayden P.C. James A. Plaisted (moderator) | Member | Pashman Stein Walder Hayden P.C. This was an outstanding presentation – full of exceptional materials and great speakers. Excellent program! Really fantastic panel! Thank you! I especially enjoyed the “behind the scenes” insights of the panel. Great panel of distinguished judges! Hon. Paul J. Fishman, United States Attorney for the District of New Jersey, Russell C. Deyo, retired Vice President, Chief Compliance Officer and General Counsel of Johnson & Johnson; Carlos F. Ortiz, Partner, LeClair Ryan; Jacqueline C. Wolff, Partner, Manatt, Phelps & Phillips, LLP; James A. Plaisted (moderator), Partner, Walder, Hayden & Brogan, P.A. Hon. Roberto A. Rivera-Soto, Partner at Ballard Spahr, L.L.P., former New Jersey Supreme Court Justice; Hon. Paul J. Fishman, United States Attorney for the District of New Jersey; Justin P. Walder, Partner, Walder, Hayden & Brogan, P.A. ; Samuel P. Moulthrop, Partner, Riker Danzig Scherer Hyland & Perretti LLP; James A. Plaisted (moderator), Partner, Walder, Hayden & Brogan, P.A. An Evening with My Cousin Vinny: Trial Techniques from a Master! *Speakers' information at the time of the program. 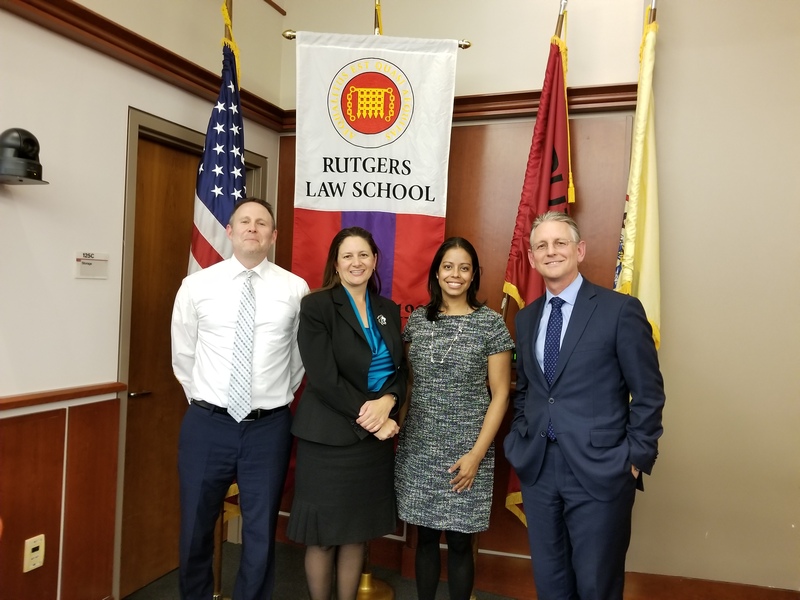 Rutgers Institute for Professional Education is the approved New Jersey and Pennsylvania continuing legal education provider for Rutgers Law School and the C. Willard Heckel Inn of Court. Approved CLE programs also qualify for New York CLE credit pursuant to the New York Approved Jurisdiction policy. Heckel Inn members, Rutgers Law alumni, and ALL ATTORNEYS are encouraged to take the high-quality, engaging, and affordable CLE programs offered by the Institute for Professional Education at Rutgers Law School at both Camden and Newark throughout the year. For a list and details of Rutgers CLE programs, visit rutgerscle.com, email IPE@law.rutgers.edu, or call 973-353-5928.